RELY-CPPS platform meets the needs of critical applications, in terms of reliability, availability and security. It combines in the same device sensor data acquisition, high-availability networking and Edge computing capabilities. Input Switchboard: Modbus TCP/RTU, Profibus, Siemens S7, MTConnect, etc. Output Switchboard: Modbus TCP, MQTT, OPC-UA, DDS, IT TCP/IP based services, etc. RELY-CPPS is a flexible platform with a high number of available configurations to offer the most suitable device for each customer. This flexibility is achieved through a wide range of optional pluggable modules, which cover the most diverse applications of the Energy and Industrial sectors. To extend the capacity of input/output switchboard, it is possible to connect a second Sensor Module to one of the non-used slots. Many Industrial applications require the storage of large data volumes locally. For example, there are many remote premises without or with limited access to Internet. Additionally, complex applications and services running in the Edge may demand extra massive storage disk. In such cases, RELY-CPPS can be supplied with the Data Logger Module, which includes an industrial temperature grade 256GB SSD Disk. 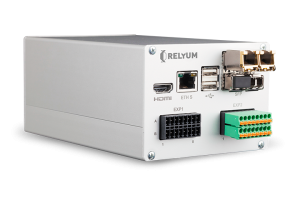 To extend the capacity of RELY-CPPS up to 500GB, it is possible to connect a second Data Logger Module to one of the non-used slots of the equipment.